Adult roosters are relatively easy to tell apart from the hens who often surround them in the chicken coop. Roosters have developed unique traits that help them attract hens and protect their flocks. You can better understand the job your rooster does within your flock if you understand how he has physically developed especially to perform his unique role. Roosters are normally fairly easy to tell apart from the hens, even at a glance. Roosters have brighter, more noticeable coloring, as well as longer tails and pointier feathers. The most vibrantly colored bird in a flock is likely to be the rooster. All chickens have some type of comb and wattle. The comb is the red, fleshy organ on top of the chicken's head. The wattle is the similar red, fleshy growth below the chicken's beak. On a rooster, the comb and the wattle will be larger and more brightly colored than the comb and wattle seen on hens. 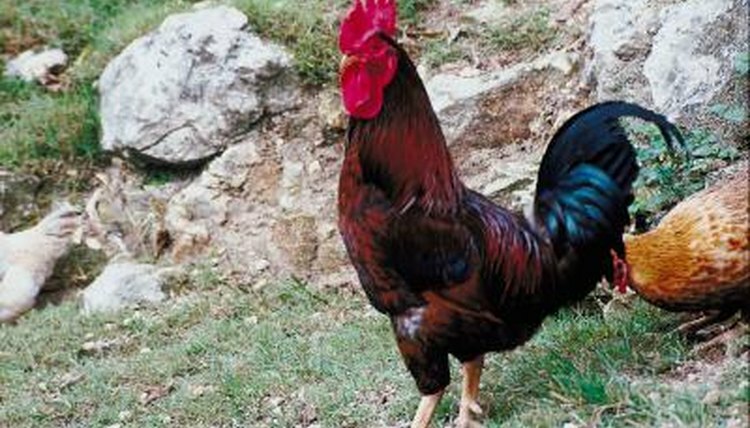 Roosters use these large, colorful growths to attract the attention of hens they hope to mate with. Spurs are sharp bone growths that protrude from the rooster's legs. Spurs can be surgically removed, but most chicken owners leave the spurs in place or manage the spurs by filing or trimming down the sharp ends. Spurs are a rooster's natural method of defending himself from both predators and challengers for his role in the flock. Roosters can do a significant amount of damage with their spurs. Roosters are the members of the flock who are responsible for crowing. Roosters have a reputation for crowing when the sun comes up every day, but they can also crow for a wide variety of other reasons. Roosters may crow to provide encouragement or attention to hens as well as announce a warning to the flock that a potential predator is approaching.